Last night I stood staring at my tree for a minute or two. Every year, I try to look at it often, because it make me feel happy. It's always a reflection to me of how the years pass quickly and if we don't slow down a little bit and be thankful for all the blessings during the year, time will just get away from us. My parents have always been there for all of us, and I know they are two of the biggest blessings in my life. They've set such a huge example for how I choose to live my life. With compassion, kindness, love, and a strong appreciation for family. My sisters... they're more than just sisters. They're my best friends. No matter what, both of them would be there for me in a second. They're my secret keepers, text message buddies, guidance counselors and so much more. My MIL - in all of her craziness (she reads my blog) :) I'm thankful for her love, excitement, and generosity. I am also thankful to have someone who cares deeply for TL and me - and who is there to provide good times and lots of laughs. My BIL Joe. We've grown closer this year. He's got a bigger heart than 99% of this world. He's a good person and friend. My wish for him in 2013 is for him to see in himself all of the beautiful and great things his family and friends already see. My extended family. All of them. I am related to LOTS of very special people. Grandparents, Aunts, Uncles, Cousins, and close friends that are like family (my bff)... they're all a blessing. I am also extremely thankful for my friends. My girls and I had a wonderful year - we hit our goal of 3 trips to visit each other - and as usual had the. best. time. With out these ladies in my life, I wouldn't be whole. They provide so much love, laughter, good memories, and friendship to my life. My home-gals who are so much fun at our bunco nights, movie meet ups, and happy hours. My dear friend Shannon. Shannon has taught me a lot about true friendship this year. (Sorry Shan, I am calling you out) For many, many years, she and her husband tried to get pregnant... and unfortunately were unable to. They are now going through the process to adopt (and let me tell you, they will be the BEST parents). When I found out I was pregnant, even through all my excitement, I felt saddened for my many friends who have struggled to get pregnant. I felt bad sharing my news when I know others haven't ever been able to share their own. When I told Shannon, she cried tears of JOY. She has expressed so much love, happiness, and interest in our pregnancy. I was amazed, truly, by her genuine and heartfelt excitement and love... and by her ability to be happy for me in a time most would struggle to do that. I hope to be a friend like her to others. Please send your good thoughts and prayers for Baby G in 2013... to read more about her adoption journey, visit her blog. I'm lucky to have a job that allows me the flexibility to do something I am truly passionate about while allowing me the time away to travel with TL. My home, car, and life's necessities. I work for a non profit - and a lot of what I do includes service to those less fortunate. I am constantly reminded of the many "things" I have. A toothbrush, warm clothing, blankets, a heater... all the things that are so easy to take for granted. I feel fortunate that I grew up in a home with two hard working parents that had the desire and ability to work hard to provide for our family... not everyone is so lucky. TL and I have so much to be thankful for this year. And next year. And not a single hour of a day goes by that I don't recognize that. Thank you to ALL of the people who read my blog and send me emails and comments. I write and share about my life because it's meaningful to me and I enjoy it. When people tell me they read along, it makes me feel so special. Thank you. Happy Holidays to you and your families!! May your holidays be filled with beautiful moments. This was so beautiful Tracy. Such wonderful things to be thankful for. I especially loved that part about Shannon. You are truly one of the best people I've ever been fortunate enough to get to know. On this "Thankful Thursday"... I am thankful for your friendship. You are one of the most loving and appreciative people I know. Your in laws are lucky to have you as a DIL. Merry Christmas sweet girl! Praying for your friend Shannon!!! Beautiful girl!! :) I might have to do something very like this...enjoyed reading it! you are so blessed! merry christmas girl! I love seeing a tree with colored lights. We also do colored lights. 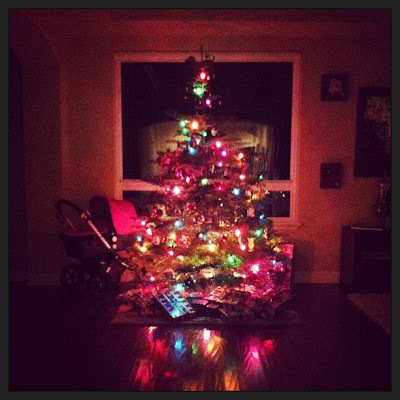 I know white lights are chic and fancy but there is just something about a tree with colored lights...and I love the baby stroller next to it! Your tree is beautiful! This is a lovely post dedicated to your loved ones. Hope you have a wonderful rest-of-the-year! What a wonderful post, so much/many to be thankful for. This is such a warm and loving post Tracy. What a gesture of gratitude too. And when I read the part about Shannon I wasn't surprised. I do read her blog and I can see that she IS that person you describe. I've been praying for her adoption process too. You guys are going to be incredibly loving mothers. I love this so much. It's important to stop and appreciate all the sweet people and things in our lives. You are beyond blessed. Happy Holidays to you and yours! What a sweet post! Baby girl has lots to look forward to in this world! A very Merry Christmas to you Tracy!